A run of blanks does nothing to encourage me to try again. Only a bit of nice weather will tempt me out when that's happening. Sunday was another of those excessively mild January days, for once without the blight of rain. I gave the roach another try. The result was the same as last time. An early bite followed by bog all. To rub salt into my wounds a carp popped its head out right in front of me. I'm sure it was laughing. 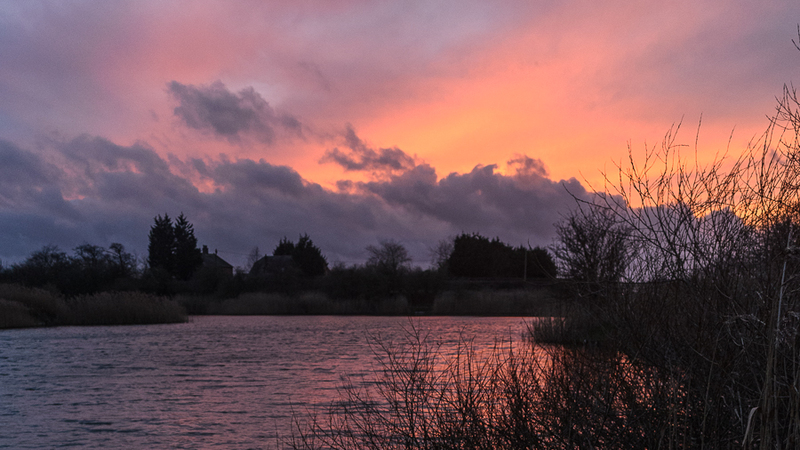 There had been a fairly strong westerly blowing putting the kind of ripple on the water that made me want to get the pike rods out. When Wednesday came around and boredom set in with varnish and glue drying and my next batch of blanks still being rolled (if I'm lucky...) the easy option was taken. The pike rods are permanently set up in a quiver. All I added was my 45 inch brolly as there was rain due in around dusk. I grabbed the carrier bag of deadbaits from my last pike session. Didn't bother filling a flask and set off. I was aghast to see the car park full and carp anglers blighting the lake. It was almost a turn round and go elsewhere job but a quick scout revealed that the carpers were shoaled up leaving plenty of room for some semi-mobile piking. As it turned out a mate of mine was also piking and in the swim next to one I fancied - we both had the same idea to keep the strong wind off our backs. The wind was both stronger and cooler than it had been on Sunday, but by no means cold. Conditions looked good and my friend had had some action. While chatting I mentioned that twitching baits only ever resulted in me finding snags. Why I bothered twitching one of my baits I don't know. It was snagged when I came to move it for a recast. Only in some of last summer's weed. But my point was proved. After an hour and a half I was itching for a move. The swim opposite looked inviting, despite the wind blowing straight into that bank. I upped sticks intending to give it no more than an hour. Luckily there was a willow bush to give me some protection from the wind. It wasn't as uncomfortable as it might have been. The bluey tail that had got snagged was in a bit of a state and not fit for a long cast, so it got dropped by the willow. A spot that usually harbours a jack. The lamprey head got the big heave and the herring tail went to my left. I waved farewell to my mate when he left for home and thought I'd have a recast. I picked up the herring rod, gave the reel handle a couple of turns and felt something pulling back. Just as I always snag up twitching baits I never get takes on the retrieve. Being taken by surprise I snatched the bait out of the pike's gob! The bait got dropped back whence it came. As if the rain had read the forecast it arrived spot on time. Out with the brolly and fight with it against the wind to get it opened out. This proved doubly difficult thanks to one of the ribs popping our of the hinge mechanism and jambing against the cover. Once that was sorted I shoved the pole as far into the soft ground as I could and pegged the guy ropes down. Thankfully the shower passed fairly quickly. Out of the blue there were a couple of bleeps from the sounder in my fleece pocket. The lamprey head was away. 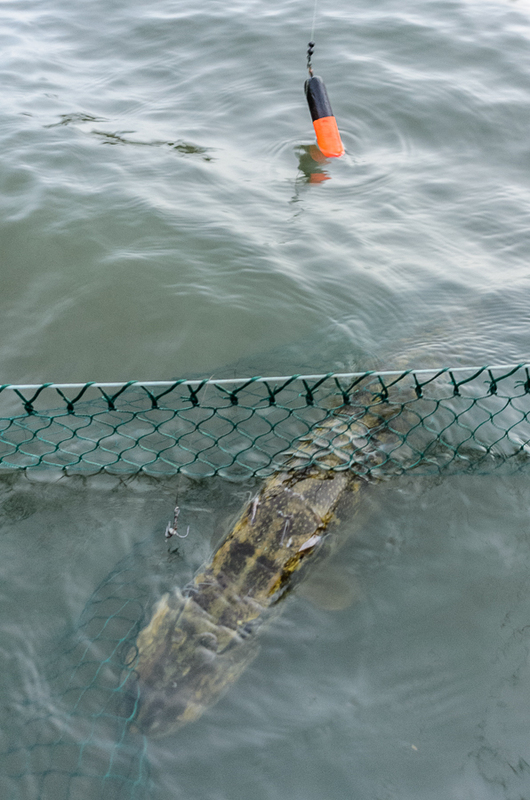 I grabbed the net and wound down to the fish. 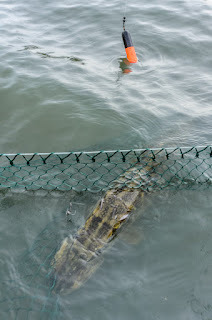 It didn't feel particularly large, but at a reasonable distance and with the pike not fighting much on previous trips I wasn't making any firm predictions. 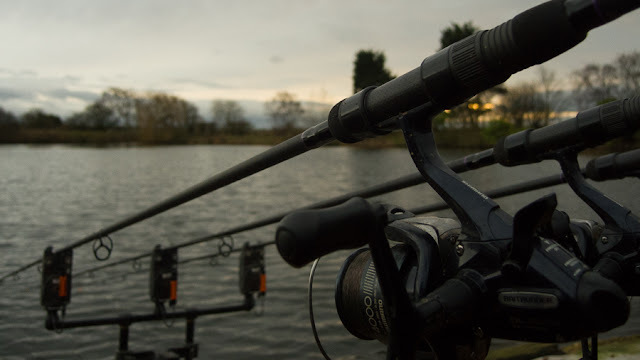 When it rose to the surface and I could see the top treble was clear of the fish, and the bottom treble right at the tip of its snout, I was prepared for it to get off should it go through the old headshake routine. Although the head was shaken the hook stayed in place. No problem with the flying treble at the netting either. Once lifted ashore the hook finally came free saving me the trouble of using the forceps. Lengthwise it looked a scraper double, but once more there was a flabby belly. A head covered in leeches made me think it might have just come on the feed. A quick trip into the sling and the scales showed that it would make ten pounds after a decent meal. There was still time for a move, but a couple of takes in this spot gave me hope of something better at last knockings. The rain clouds were building too. However they scudded away to the south and a briefly colourful sunset followed. The hoped for monster requiring the headtorch to read the scales failed to show up and I slipped and slid my way back through the mud to the car. This morning I attacked my umbrella with a pair of pliers and a bit of stainless steel wire to replace the rivet that had popped out. That's three such repairs I've carried out on this brolly. Only five more ribs to do! On the rod building front I've just complete a set of three P-1s with a slightly different handle configuration. It's one I didn't think I'd like the look of, but it's turned out better than anticipated.I think the collars and winding check help the look, and the gunsmoke reel seat - which matches will with an Ultra Matt blank finish and SiC rings.